It's been said that artists don't retire, they just reinvent themselves. 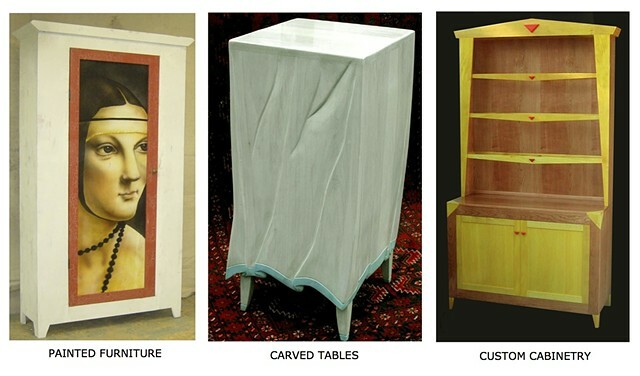 Jim Williams of ARTISTIC CABINETRY has had a long artistic career taking him in various successful directions, all of them innovative. After his graduation with a degree in sculpture from the Art Academy of Cincinnati, for 20 years Jim worked as a master illustrator and pioneer in the use of airbrushing. His love of residential renovation led him to found ARTISTIC CABINETRY, a business focusing on the design and construction of high-end built-in cabinetry and free-standing furniture combining beauty with function. Jim then embarked on another artistic path, faux painting on plain furniture by using his finely developed skill at airbrushing to apply masterpiece replicas to pieces. He also carves wood furniture into whimsical free-floating sculptural designs. He is enthused about making art accessible to people. "I've always been passionate about art," he comments. "This is my way of sharing my love of art with others in a functional way." For inquiries, contact Jim at (513) 470-1958 or by email at Jim Williams.